Once upon a time, there was a faraway kingdom filled with adventures and happy endings. The glimmering spires of the castle were a beacon of peace to all who inhabited the realm. Far beyond the castle walls, tales were told of this Fantasyland in chateaus and wooded cottages. In these woods, however, there was also a warning about venturing further into the darkest parts of the forest. For there lived witches and ghoulies of the foulest sort. Alright, so that may have been a bit dramatic, but just imagined a Fantasyland where the host of Disney villains had a proper home to hang their pointy hats! That’s right, boys and girls, were putting on our ‘what if’ caps today and exploring what could be as part of the Fantasyland expansion. With current plans in a state of flux, it is the perfect time to dare to dream. Since the announcement of the Fantasyland expansion, there has been a single element gnawing at a number of guests, the princess and girl-centric ideas permeating the plans. From the princess meet and greets to the Pixie Hollow redo of Mickey’s Toontown Fair, nothing seemed to scream out to little boys and boys at heart. The bland answer would be that boys have Frontierland, Tomorrowland and Adventureland, but in all honesty, there is appeal in all of these lands for girls as well. Having been a boy myself, many moons ago, I can let you all in on a little secret… boys love to play villains just as much as they love to play the heroes. Expanding Fantasyland to be more inclusive of villains is not a new concept. 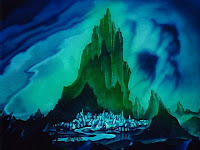 During the waning days of the last century, there were discussions about the creation of a Villains Mountain area near the abandoned 20,000 Leagues Under the Sea. The concept, would have included crocked cobblestone alleys leading towards Bald Mountain. Inside a cave, guests would have boarded sinister flume boats, modeled upon Hades skeletal dinghy from Hercules, and move in for a closer look at a villainous gathering. Upon startling the collection of malcontents, which would include all the most posh villains like Maleficient, Captain Hook, Hades, Cruella De Vil, Jafar and so on, the flume ferry would begin making a mad dash through the caverns in an attempt to escape. After encountering a few nasty surprises and enraged evildoers, the guests would find the only way out would be down a massive waterfall, similar to the briar patch fling of Splash Mountain. Obviously, looking at the space available and what has already been claimed by new construction, this attraction could not be added to the area today. However, no good idea never dies, but it can be cannibalized into something new in the greatest of villain traditions. With the space left from Fantasyland and the soon to be razed Mickey’s Toontown Fair, there is enough land for some baddie building. In the new construction, we know forced perspective is going to be applied to the Beast’s castle, from Beauty and the Beast, why not apply the same laws of sight to a far off Bald Mountain. Jagged cobblestone alleys with apothecaries, roving villains, storytellers with a tender spot for evildoers, tailors and armories could lead to a scaled down villain attraction. With all the emphasis being placed on interactive attractions these days, the main draw in this land could be an amalgamation of the concept of Villain Mountain and Buzz Lightyear’s Space Ranger Spin/Toy Story Midway Mania. In such an attraction, guests would once again startle the plotting villains, sending them into a tizzy. The guests in this adventure, however, would not be completely unarmed. Using magic wands or potion producers, the guest could spring traps on the villains, open doors, send gates crashing down, cast diversions, blast minor bad guys and eventually escape. Boys and girls alike, not to mention parents and older siblings, would relive their battles for years to come. Of course, who actually knows what will happen with Phase 2 of the Fantasyland expansion. While I would be ecstatic to see villains finally given a lair of the own, I’d be just as happy with a massive Never Never Land complex with Hangman’s Tree, or a thousand other ideas. The real question is, what would you add to Fantasyland to make it appeal across the gender divide? Thanks so much for posting this. I really enjoy these "what-if ?..." articles. "...The real question is, what would you add to Fantasyland to make it appeal across the gender divide?"